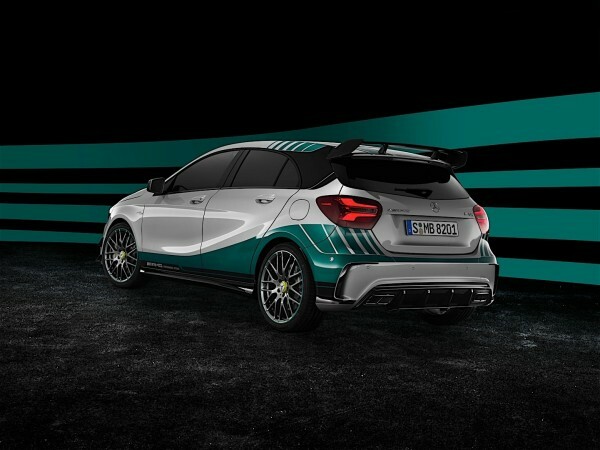 Mercedes-AMG A45 Petronas 2015 World Championship Edition is a special edition to celebrate the manufacturer’s victory in constructor’s as well as driver’s championship. 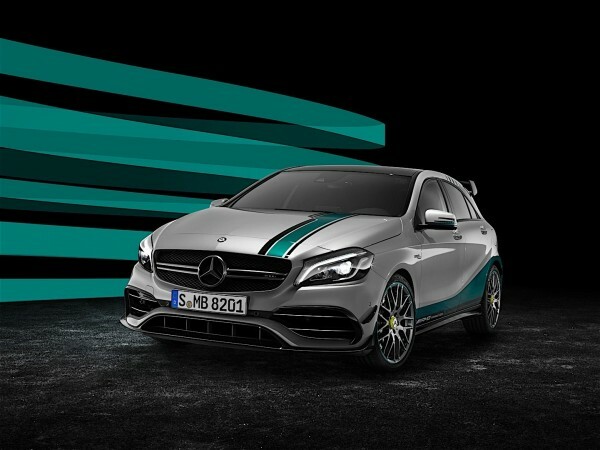 To celebrate this victory at the Formula One World Championship 2015, the manufacturer will unveil a Mercedes-AMG A45 Petronas World Champion Edition at the Grand Prix Championship at Abu Dhabi later this week. The special edition is finished in the same petrol green color that runs around the winning F1 car. It is offered with a choice of three colors – mountain grey metallic, designo mountain grey magno and polar silver metallic. The Mercedes-AMG A45 special edition is a cosmetic kit which adds some aerodynamic components inspired by the F1 car. It gets larger splitter and special flics in the front and a roof spoiler at the rear. The interior too has undergone some upgrades. The hot hatch is now fitted with electronically adjustable performance seats made of leather/DINAMICA micro fiber. The steering wheel is stitched with petrol green color. There is also a high quality badge on the lid of the storage compartment with MERCEDES AMG PETRONAS engraved on it. The petrol green color is seen in many other places like AC vents, seat belts, etc. running in and around the car. The Mercedes-AMG A45 special edition also gets the AMG Dynamic Plus Package, AMG Exclusive Package and Night Package. The car is powered by the usual 2.0-liter, turbocharged, petrol engine that produces 381 HP and 475 NM of torque. This motor is mated on a 7-speed dual clutch, autobox that comes along with the all-wheel drive 4-matic system. This makes the car do 0-100 km/hr in just 4.2 seconds. The Formula One World Championship 2015 was won by the Mercedes-AMG Petronas. The winner for the driver’s championship was Lewis Hamilton. The English driver won his third world title with 363 points against his name. He was followed on the second position by his Mercedes teammate Nico Rosberg with 297 points. The German automaker also won the constructor’s championship. So, we can say that the 2015 season was dominated by Mercedes-AMG Petronas.